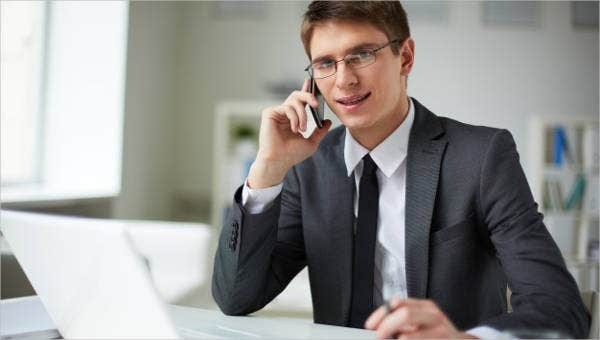 Leasing consultants are very important point persons, especially for people who want to ask information about a space or area that they want to lease. It is of most importance to know all the details of a place first before actually jumping to the decision of leasing it. There are many items that a leasing consultant can point out, especially about the leasing terms where a person will be bound should he or she decide to lease a property. If you are planning to lease an area for a long duration of time, it is very essential for you to get the services of a leasing consultant as it will allow you to weigh in your decisions properly. 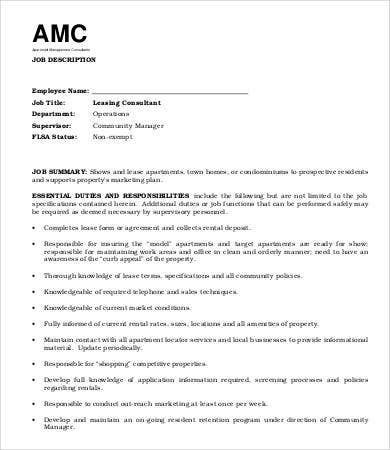 Other than the job description of leasing consultants, we can also provide you with a Job Description Template that is used in different fields of work and industries. 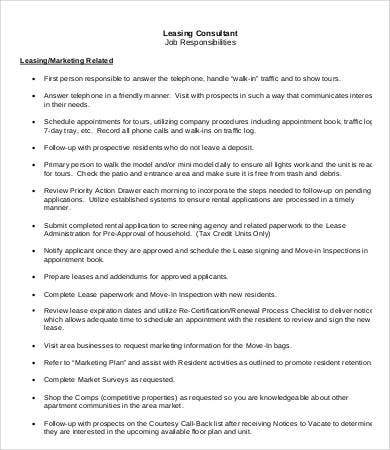 Assure that the target market knows information about the properties to be leased may it be an apartment, a town house, condominiums, and other forms of residential and commercial properties. 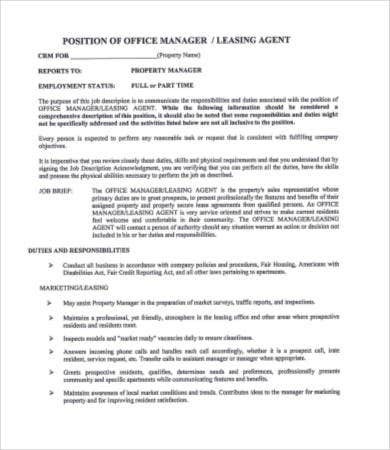 Assure that the lease form is completely filled and that the leasing agreement has been signed by the client to assure that they understand all the terms and guidelines that they need to follow within the duration of the lease. Make sure that all the properties are well maintained is always ready for viewing so that there will be higher chances that possible clients will be impressed. Maintain contact with all the maintenance services and other establishments needed to assure that the property is well taken cared of. Ability to know and understand the policies applied in the leasing industry. Conduct outreach marketing to get more clients bases and tap a new market that will be beneficial for the sales growth of the property being offered for leasing. 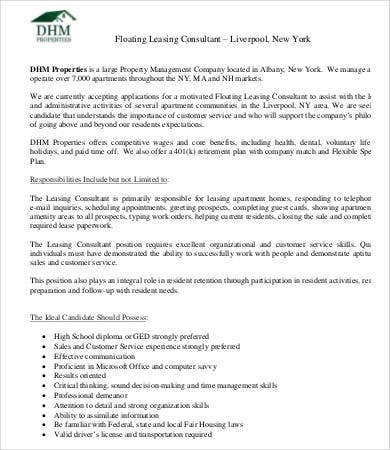 Other than our leasing consultant job description, you may also be interested to browse through our Consultant Job Description and Marketing Job Description. 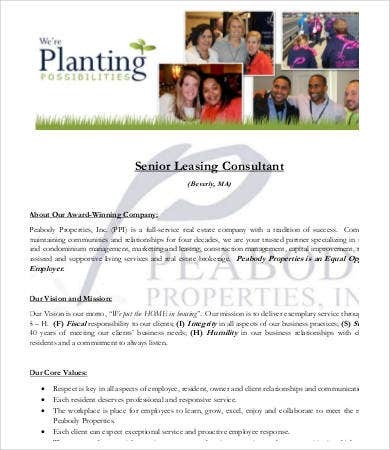 Am I Fit to Be a Leasing Consultant? 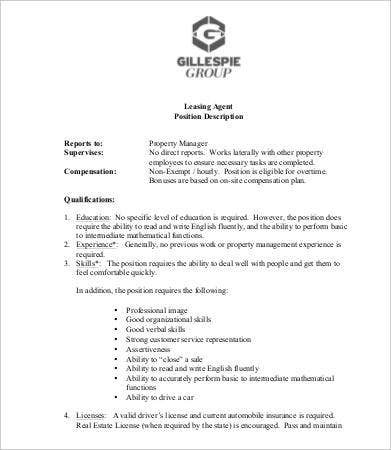 Aside from our Leasing Consultant job description, you may also download our Real Estate Agent Job Description.